Stephanie Usry cared personally about her co-worker — she was one of her best friends! Because of this, Stephanie found herself in a tricky situation. She was so focused on showing that she Cared Personally that she missed the opportunity to help her friend by giving a Direct Challenge. Her story is a reminder why it’s important to Challenge Directly, especially when you care about someone. Watch the video of her story to find out what happened. Many of us struggle with Ruinous Empathy. We want to build and maintain relationships with people, so we don’t want to say things that upset them. But if you focus too much on caring personally and don’t offer directly challenges when you see something that isn’t right, it can lead to far worse outcomes. Reading and listening to stories about Ruinous Empathy will help you understand that others have the same struggles that you have. Hearing how these situations turned out will hopefully help inspire you to Challenge more Directly! 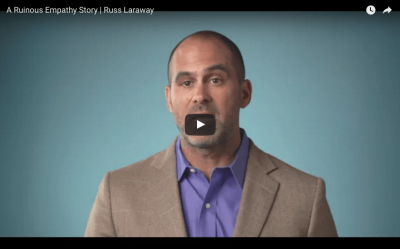 This story from Candor, Inc. co-founder Russ Laraway describes a time when he withheld a direct challenge. Find out what happened next in the continuation of the story! Praise can be Ruinously Empathetic when bosses try to be “nice” and get things wrong. Below are a few cautionary tales of how trying to make a person feel good without taking the time to understand the details of their work to challenge them appropriately can go astray. Perhaps the most famous example of praise gone wrong was when Bush said on national television to the head of the Federal Emergency Management Agency (FEMA) during Hurricane Katrina: “Heck of a job, Brownie!” What was so horrible about that? Brown was under enormous stress, and Bush was trying to be a supportive boss. Problem was, FEMA was doing a disastrous job, and everybody knew it. Still, wasn’t Bush right to be supportive in the midst of a crisis? No! By publicly praising a person who was failing, Bush inadvertently highlighted what a terrible job Brown was doing and made him a laughing stock. Just because you’re the boss – or even the President of the United States – doesn’t mean that anyone will believe your assertion that somebody is doing a good job when in fact they are not. And your assertion will make you look either ignorant or soft-headed. A boss’s job is not to win popularity contests. A boss’s job is to point out to people as clearly and with as many specifics as possible when they are doing a bad job, AND when they are really doing a good job. It’s generally a good idea to point out the good things in public and the bad things in private. But telling somebody in public they are doing a good job when in fact they are doing a bad job is far worse than just saying nothing at all. The key is to avoid pat phrases like “good job,” or other things you’d say to your dog, and to be specific. Another point to keep in mind for praise is to make sure to remark on something of substance. A friend worked extremely hard on some analysis for the CEO of his company, and the only thing that got praised was the formatting of the presentation. No amount of criticism of his ideas could have been as discouraging as the flip praise of something he thought was unimportant. When giving praise, it’s important to praise what is in fact best and most important. Be specific about what’s most relevant. One boss tells a cautionary tale about a time he praised the wrong person right after a major launch. The team was working all night, and very late he bumped into an engineer, “Anatoly,” and asked him about a particular feature. Anatoly answered his question, and told him about several important aspects of the feature. A couple days later, when celebrating the launch, this boss, wanting to praise Anatoly, congratulated him on his excellent work on the feature. But Anatoly hadn’t worked on that feature. All the engineers who had worked on it now thought Anatoly had claimed credit for something he hadn’t worked on. Chagrined, Anatoly sent an email out to the whole company, explaining that he hadn’t worked on it and listing the people who had. The boss realized that, trying to make Anatoly happy, he’d accidentally thrown him under the bus by not being deep enough in the details when he gave praise. In short, when giving praise, take just as long to get your facts straight when giving praise as you would when criticizing. Be specific. 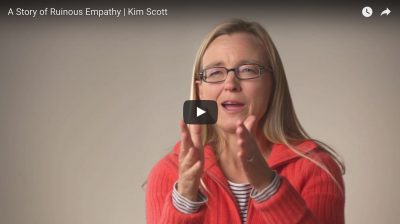 Do you think your feedback is often Ruinously Empathetic? If so, you’re not alone. 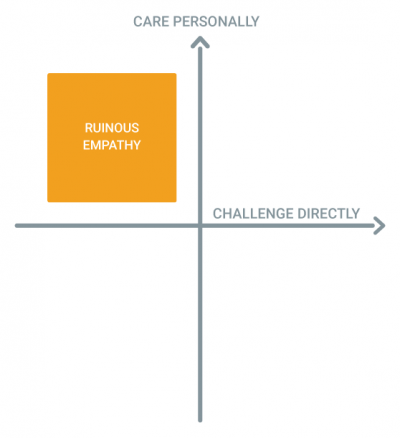 In our experience, most feedback mistakes fall in the Ruinous Empathy quadrant. People tend to back down from their Direct Challenge because they want to be “nice.” But don’t despair, we’ve got advice for moving away from Ruinous Empathy and towards Radical Candor. There’s a point that Kim makes at the end of this clip that we want to reiterate. She clarifies that “Just say it” is advice for those who exhibit Ruinously Empathetic tendencies. For those who fall in Obnoxious Aggression, this isn’t the right reminder — they are already saying it, and they need to focus more on showing that they Care Personally. 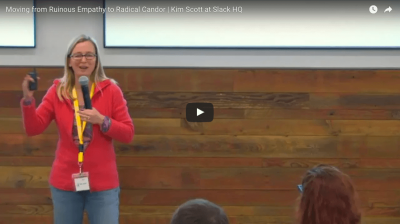 But the reason we summarize our message as “Just say it” so frequently, including in our recent Radical Candor video, is that most people are more likely to behave with Ruinous Empathy than Obnoxious Aggression. 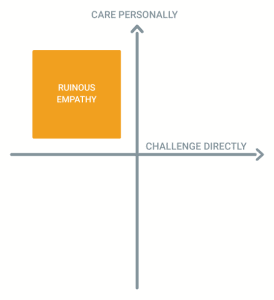 However, not everyone is, which is why we introduce the Radical Candor 2×2 framework with two axes. Challenge Directly AND Care Personally. We hope that even though we simplify our message in some situations, you won’t lose sight of the spirit of Radical Candor. Radical Candor ≠ Front-stabbing. 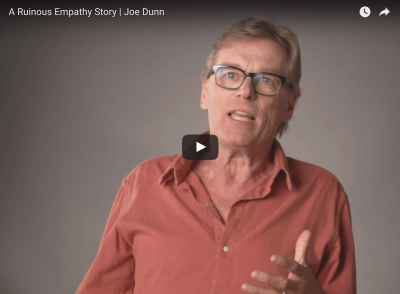 For more detailed tactical tips than what’s covered in this short video, read our full post about how to stop behaving with Ruinous Empathy and our post about how to give Radically Candid feedback.